Vitamin E is a fat-soluble vitamin found naturally in foods, such as fats and vegetables, corn and canola oils. It plays a role in the production of red blood cells and enables your body to use vitamin K effectively. Deficiencies in vitamin E are rare but may occur with people who aren't able to absorb properly. Vitamin E supplements are available alone and in combination with other vitamins. Consult a physician before using supplement to prevent drug interactions. Coumadin is the brand name of warfarin, which is a coumarin derivative used for the prevention and treatment of blood clots. Patients who have had a heart attack may be given Coumadin to prevent a blockage from a blood clot. The medication works by blocking the formation of coagulation factors that require vitamin K, which are needed to coagulate the blood. It's available in injection and tablet form and dosed according to need. Vitamin E can block coagulation factors that are dependent of vitamin K in the same manner as Coumadin. 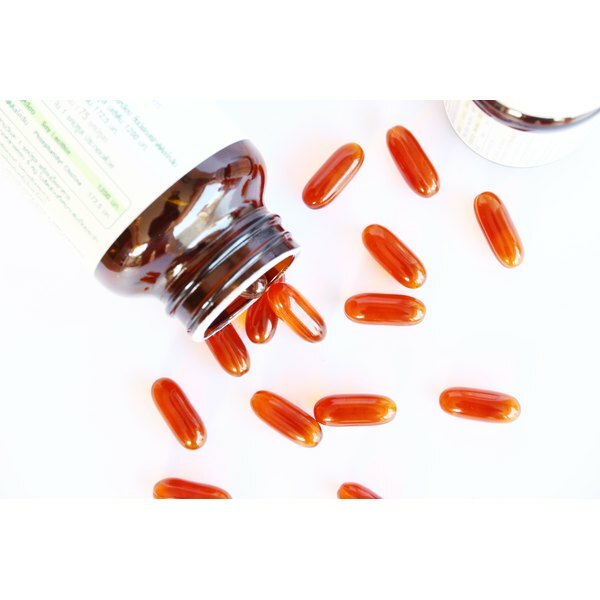 According to the Office of Dietary Supplements, taking large doses of vitamin E with blood thinners, including Coumadin, can increase the risk of bleeding. The risk rises if vitamin K intake is low as well. If you develop signs of bleeding, such as bruising easily on the skin, bleeding gums, reddish-brown urine or black tarry stools, stop the medication and contact a physician right away. Avoid the use of vitamin E supplements with Coumadin. Multivitamins may also contain vitamin E. Read all drug labels before starting any over-the-counter or herbal medications to ensure no vitamin E is present. If you're unsure of the ingredients of any product, ask your physician or pharmacist. Normally, you don't need to change your diet when starting Coumadin; instead, you should keep a consistent diet to avoid fluctuations of your normal vitamin E level. If you plan on changing your diet, consult your physician. Coumadin requires close monitoring, so you should keep all physician appointments to ensure the medication is working properly. If you need to take vitamin E, your physician may need to lower the dose of Coumadin; on the other hand, if you were previously on vitamin E and need to stop, your physician may need to raise the dose of Coumadin. Never take higher doses of any medication than recommended by a physician. What Foods Can Affect Coumadin Levels?